Printed on 14 oz. vinyl for excellent indoor or outdoor durability. We use the same high quality signage vinyl for these small poster banners as we do for the larger size banners. May include grommets for hanging. 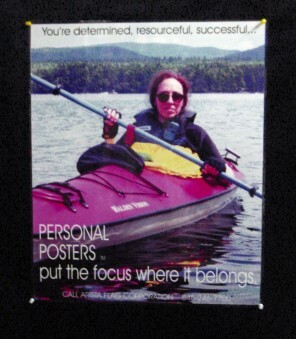 Posters can be finished for convenient mounting and display with double-sided Velcro tape, grommets, or plain finish. Your full size banner designs can be outputted in poster size to increase exposure to your presentation in an very affordable manner. Sizes: 12" x 24" Size: 24" x 48"
Printed on 14 oz. vinyl for excellent indoor or outdoor durability. 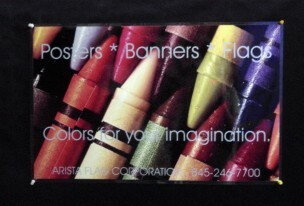 We use the same high quality signage vinyl for these small poster banners as we do for the larger size banners. Includes grommets for hanging. You can choose any of several designs as a single unit, or 3 pack of the same design, or 6 pack of the same design. Choose from the list of designs. 12" x 24" as low as $13.00 ea. 24" x 48" as low as $38.00 ea. For more information about this product: Go here. Printed on heavyweight 170 gram sign paper with additional backing sheet. 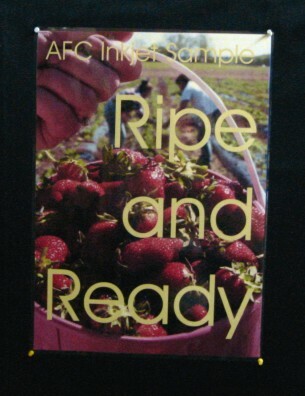 Laminated on front and backside for durability. Includes grommets for hanging. 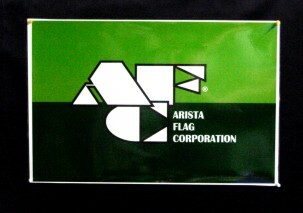 To purchase these items at our Internet Flag Store. in Addition to Your Large Full-Size Banner!